Fun fitness or institutional coercion? However high the “happy meter,” I’m suspicious of institutional coercion. Dance is usually an expression of spontaneous energy or an organized set of movements that express a culture or a belief system. 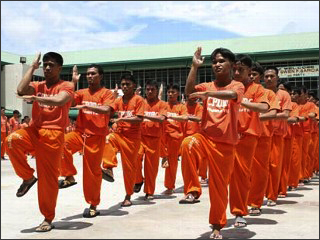 It is typically voluntary, unless a cowboy is aiming a six-shooter at your feet while shouting, “Dance!” But the dance numbers at Cebu Prison are mandatory; prisoners spend upwards of 5 hours a day perfecting their moves. Some of the earliest YouTube posts came from video tapes of dances done for a visiting VIP. We YouTubers feel good watching 1,500 men in orange jump suits groove to the beat. But what if we were the ones forced to dance because someone thought it was good for us? There are a lot of things that are good for us, yet we prefer not to do them because there are other things we’d rather do—some bad (like taking illegal drugs or drinking excessively), some good (like reading a book or watching Project Runway). At least the choice is ours. I wonder how many prisoners would “opt out” of dancing if given the opportunity. You can claim that we, the unincarcerated, have earned the privilege to choose our pleasures because we’ve stayed on the right side of the law. You can say that my concerns are soft-headed. After all, they’re prisoners—who cares if they are forced to perform? O.K., maybe I’m making a big deal out of nothing. But what if these prisoners perform under threat of severe physical punishment? How would we know? Who is overseeing this prison? An online ABC News report raises my worst suspicions. Also, check out this report. Also there is the issue of remuneration for the prisoners. They have been watched by millions presumably without their consent. They are celebrities who receive no money for their hard work. Who benefits? YouTube (and Google, which owns YouTube). Even the would-be impresario that runs the prison in the Philippines receives no money for his efforts–though one imagines he is thrilled with all the attention his restaging of “Thriller” has received from those of us who laugh and/or gawk at the spectacle he has created. This is related to why the writers’ union went on strike—they wanted to make sure they were paid for material they wrote for tv or film that was then streamed on the web. YouTube allows users to provide content, but it also pays no one for their efforts. As anyone who uses the site knows, the videos on Youtube range from the ridiculous to the sublime (and sometimes these opposites mingle within a particular video) and although certain videos go viral (like the Filipino prisoner videos), others remain undeservedly obscure. YouTube should set up a foundation to support media artists—exposure is good, but so is financial support, and with money comes production values. In 2008 advertising revenue generated from online video sites will reach 560 million dollars and YouTube represents 73% of this market. Even though Google asserts that they have yet to make a profit from YouTube, the corporation needs to start supporting those who have enabled its success; otherwise YouTube will consist mostly of content produced by corporations rather than innovative, challenging work created by individuals.